A new German doctoral dissertation on European company law has been published. 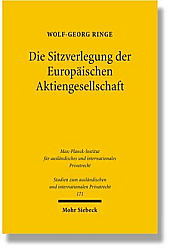 The thesis of Wolf-Georg Ringe (Hamburg), Die Sitzverlegung der Europäischen Aktiengesellschaft deals with the transfer of seat of the European Company which is also known as "Societas Europaea" (SE). Transfer of seat has a significant impact on companies – in particular for economic reasons – and has been subject of the ECJ's jurisprudence on several occasions in recent years (Daily Mail, Centros, Überseering, Inspire Art). However, since the mobility of companies has been subject to the different national legislations so far and a company's right to leave the Member State of origin is not protected by Art. 48 EG-Treaty (right of establishment), the issue of transfer of seat has – according to the author's point of view – not been solved satisfactorily by now. By introduction of the European Company as a supranational form of a company by means of Council Regulation (EC) No. 2157/2201 of 8 October 2001 on the Statute for a European company (SE) the question of transfer of seat has gained a new dimension. This Regulation provides for the first time an opportunity for large enterprises to choose a community-wide uniform corporate governance.The European legislator aimed in particular at creating a new instrument to overcome the difficulties relating to the cross-border transfer of seat. Thus, the present thesis examines as to whether the new Regulation is capable of solving this problem in a satisfactory way. For this purpose, the author first classes the problem of the European Company's transfer of seat with international company law and shows that the Regulation did neither adopt the the real seat regime nor the registered office regime, but rather established a new concept by referring, on the level of choice of law rules, to the registered office and by interlinking, on the level of substantial rules, the registered office and the head office (Art. 7). In the second part it is examined as to whether Art. 7 s. 1 of the Regulation – according to which the registered office of a SE shall be located within the Community, in the same Member State as its head office – is in line with the right of establishment. This might be questionable in view of the ECJ's jurisprudence (Überseering) where a broad interpretation of the right of establishment has been adopted. Concerning this question the author adopts a critical attitude and suggests a review of the Regulation. In the third part the author attends to applicatory problems of the transfer of seat, in particular to the balancing of the different interests of involved parties. The fourth and last part of the thesis deals with the transfer of seat in cases which are outside the scope of Artt. 7 and 8 and are therefore not covered by the Regulation. Ringe finally comes to the conclusion that the European Company's model of transfer of seat constitutes the first possibilty to transfer a company’s seat within the European Union on the basis of a comprehensive legal framework. Thus, the rules on the European Company’s transfer of seat are regarded as a welcome opportunity to facilitate companies’ cross-border mobility. How can I order a copy of this book?